When you plan to participate in a trade show there are so many details to consider; first is usually the placement of your booth. You strive to capture a great location that ensures high traffic and great visibility. However, another way to capture attendee attention is by creating awareness, mystery and excitement before the event even begins. In an article by event manager Holly Barker, she offers 10 ways to create excitement for attendees. Her audience is the convention planner however many of the ideas she offers translate well to the management of your trade show displays. Let’s look at two of those ideas. Allowing your attendees to see a bit of the fun before they arrive at the event will excite them more! Just like a movie trailer, put together a fun 2-4 minute collage of event highlights to look forward to. This could even be snippets of some of the keynote speakers, to create buzz around their speaking sessions. Be sure to include hashtags, social info, and make the videos fun and engaging. An easy way to make this work for your company is to create a video made from images of your business. Animoto is a wonderful (and free) resource that takes your images and text, combines it with music to create a 30-second video that you can send to attendees and post on social media. 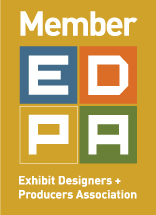 Check out this simple example created for E&E Exhibit Solutions. When attendees post questions to social, send an email or come up to event staff onsite, be sure to have a response ready to go in a prompt time frame. Events can be overwhelming, and attending events can be stressful if you have never been to a specific venue before, or know where you are going. Event planners should keep FAQ’s on hand and prompt their staff with a quick list of “top ten” questions that come up at every event you should be aware of. This will be helpful when answering questions. The key to this idea is to be available, responsive and to anticipate what attendees might want to know about your company. Make sure attendees know in advance that you will be making it easy for them to connect with you. Creating a Frequently Asked Question sheet is perfect for those visitors to your booth who are interested in information but don’t want to hang around long enough to talk to one of your sales associates. A better idea is to make this a mobile application or digital download so that attendees can access the information without being burdened by yet another piece of paper. Offer after hours meet and greet times. For those interested in longer conversations or perhaps a chat over a beverage, consider having a few times set aside to meet off the convention floor for more in-depth conversations. This is especially valuable if you want to chat with someone who is also managing a trade show booth at the same event. Monitor your social media accounts on a regular basis so that you can identify and address questions and comments in real time. Although social media is becoming more commonly used, you will still be ahead of your competition if you make the most out of your social media networks during the event. The efforts you make prior to the trade show event will help make your booth a destination location. Of course, it also helps to make it easy for attendees to find you with a few special trade show accessories. Hanging Signs make your booth visible from across a crowded room. Creative, custom lighting is another way that attendees will be drawn to your trade show display. Whether you use spotlights, overhead lights, recessed lighting or have trade show exhibit displays that light from within; lighting is a great way to grab the attention of attendees as they walk past your booth. If you are interested in learning about some of the trade show accessories and trade show graphics that are available to help you stand out from the competition, give us a call.